Full length studio portrait of Charles Spence Bate seated and holding a book in both hands on his lap. Bate sits between a table, to the left as viewed and a curtain to the right. Printed below the image: “MAULL & Co. LONDON”. The reverse is variously inscribed and printed with a coat of arms: “MAULL & Co. PHOTOGRAPHERS, 55 GRACECHURCH STREET, 187a, PICCADILLY, and TAVISTOCK HOUSE, FULHAM ROAD, LONDON”. There is a pencilled negative number: “34805”. 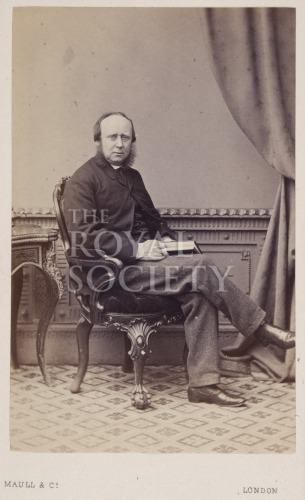 Charles Spence Bate was elected a Fellow of the Royal Society in 1861.